All around us, innovators are building cooperative, ethical, and community-rooted enterprises, reclaiming the commons, and democratizing and reorienting finance. We are finding new ways to share skills and goods, measure success, and meet growing human needs on a finite planet. At the same time, our growing mobilizations in the streets are building power to resist and replace unjust systems. Through all of these efforts, a movement is emerging that could change our society and the world. Join us to meet other advocates and practioners, build a shared narrative, and strengthen the emergent local network for systemic change. The New Economy Get-Together is a flagship event of the national New Economy Week 2015. 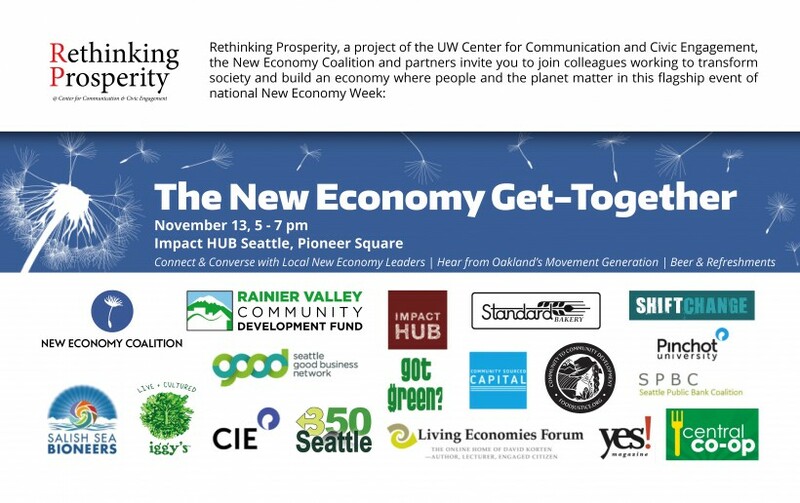 Now in its third year, and first Seattle event, New Economy Week 2015 will challenge us to explore what systemic change really looks like. We hope that by drawing attention to big ideas and concrete examples of real solutions, we will expand the public conversation and what’s politically possible, bringing us closer to a just, sustainable, and democratic society.